So your SIM card is older than mother Earth itself and your SD memory card has seen more phone entrails than it would be happy to admit. Usually at those flash memory dinner parties that it goes off to while you're sleeping. Imagine the thick data jungle that your phone must be holding. Hundreds of contacts, dozens of message conversations, a thousand pictures (vaguely equivalent of one million words) and a collection of apps which if they were to be random objects, you would most definitely be called a hoarder. Have you ever considered sorting out that mess? I bet you have, but you really need a PC to do it. Because we always turn to PC's when we figure out that our shiny gadgets can't handle everything. Moborobo is the solution to your problem because it provides a bird's eye view on your entire data collection. Not only does it gives you a clear image of your device's contents but it also allows you to manipulate it. 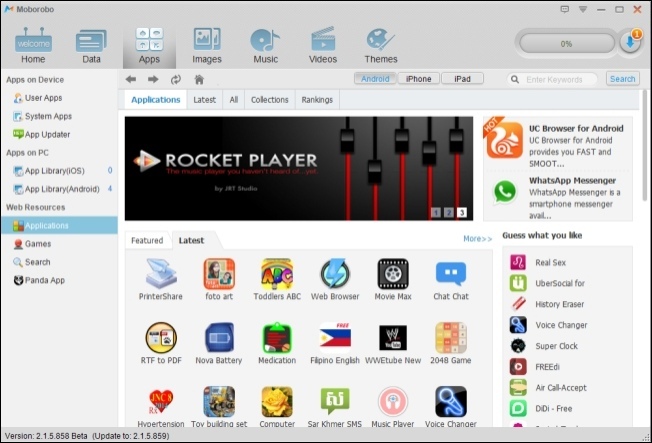 Moborobo sorts out all the contents into general categories, namely Data, Apps, Images, Music, Videos and Themes. The Data screen sorts out your contacts, messages and call history allowing you to discard any phone numbers or SMS conversations that you no longer have a use for, you tyrant! You can edit or even add new contacts down to every detail. The Apps screen might look familiar to an iSomething user. In addition to displaying all of the installed apps it also features a Market. If you look under Web Resources you can find Mobo Market, a Play Store replica that behaves just like iTunes. You can download from it, store and install to your device all at zero costs! Well hold on a second, don't be jumping like a kid who just discovered The Pirate Bay because it only includes the free apps (demos, freemiums and the truly free ones). Still, it's much more comfortable than squinting at your little phone screen while your index finger is in the way. 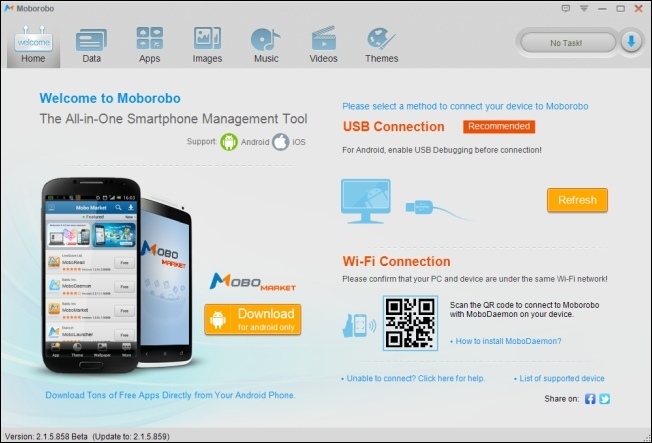 Mobo Market is also available as an app for your phone or tablet. You can install it and download apps directly to your device if you so wish. No one will suspect you're using something else. Yet remember that you will need to check "Unknown sources" under Settings\Security, Mobo Market will see that you are directed there when required. Remember that enabling "Unknown Sources" will allow the installation of apps not from the Google Play store. Google Play is the safest public source for Android apps. Installing from any other source is at your own risk and implies that you know what you are doing. The other screens simply manage your media files and also provide a very limited source for more images, music, videos and themes. Wi-Fi Connection – With MoboDaemon installed, your device can connect to Moborobo via Wi-Fi but they clearly recommend connecting through the USB port. App Updater – It can inform you of updates and also install them selectively. Task Manager – A separate window that tracks your downloads and installation tasks. The App Updater is found in the Apps screen is very useful if you have a lot of standing updates and want to pick and choose which App will be privileged to receive it. I wouldn't bother with the Wi-Fi connection unless I develop an obsession about removing all the computer wires from sight. Detailed device management that allows for easier maintenance of your data including backup. You can manage app updates. Sometimes convincing Moroboro to see your phone may prove quite difficult. Web Resources are mostly just bloating the interface. Moborobo is bloody useful! Especially if you're running Android, because Google Play and "device management tool" are two different concepts. Furthermore being able to manage your phone contacts on a bigger screen is something that everybody deserves.